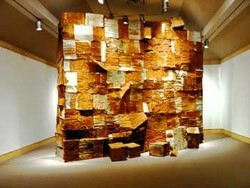 EXHIBIT: "Gawu," metal tapestries and other sculptures by contemporary African artist El Anatsui. Hood Museum of Art, Dartmouth College, Hanover, N.H. Through March 4. West African sculptor El Anatsui digs into both trash and tradition to create shimmering metal tapestries and remarkable freestanding forms. His current traveling exhibition, entitled "Gawu," is on display through March 4 at Dartmouth's Hood Museum of Art. The work responds to the growing blight of scrap-metal cans and lids in the artist's country - the result of modern packaging in products sent from Europe and the U.S. "Being that you don't have the means to recycle, there develop huge piles of milk tins, drink tops, and all these things all over the place," Anatsui explains in an artist's statement. "So [the work] is an examination of consumption and the various landmarks it can generate." His multimedia pieces also reference age-old West African idioms of weaving and textiles. Originally from Ghana, Anatsui has lived in Nigeria since 1975. There he and his studio assistants bend and fold gathered metal detritus and sew it into massive sheets, which bear patterns reminiscent of woven ceremonial kente and adinkra printed cloth. Traditional adinkra black-and-white cloth is alive with geometric patterns that predate Western influences. Anatsui's 2003 "Adinkra Sasa" is a 16-by-18-foot black tin-can tapestry with broad yellow stripes and alternating geometric patterns. A few large, horizontal wrinkles contour the luminous, sprawling composition, which is made of thousands of small metal strips. The massive, gold-toned 20-by-19-foot veil entitled "Hovor," from 2003, gleams like a gilded Byzantine mosaic. Installed not far from the museum's 8-by-10-foot Mark Rothko painting "Orange and Lilac Over Ivory," the work dwarfs the American modernist masterpiece. Yet "Hovor" also shares the looming, luminous power of the Rothko. Like "Adinkra Sasa," this piece has deep folds and ridges, like a three-dimensional contour map. Cans with vertical red bands boldly stripe the gold expanse. Produced in 2006, "Versatility" is another golden, cloth-like piece. The 12-by-14-foot patchwork of metal consists of the tops of alcoholic beverages that, in Anatsui's words, "encapsulate the essence of the alcoholic drinks which were brought to Africa by Europeans as trade items at the time of the earliest contact between the two peoples." The colorful labels of the smashed cans punctuate the bright, metallic cloak. Like kente patterns, the strips of metal are organized both horizontally and vertically. Dating from 2000, the freestanding "Crumbling Wall" is a monumental 13-by-18-foot monolith composed of rusty squares of galvanized metal. Anatsui punched holes in the metal with hefty nails, mimicking the technique used to produce homemade "gari" graters that are employed in preparing cassava porridge. The joined squares have weathered, wrinkled surfaces, and waves run horizontally across the face of the piece. A few similarly constructed sheet-metal boxes lie at the foot of the wall. Thirty freestanding cones of various heights, averaging about 3 feet, make up the "Peak Project" of 1999. Their aggregation is as playful as "Crumbling Wall" is solemn. Like giant sequins, or coins on a belly dancer's costume, the tops and bottoms of opened cans were wired together to construct the irregular cones. The "Peak Project" cones are also reminiscent of several traditional African architectural forms, from Dogon village roofs to the granaries of Great Zimbabwe. On the website of UCLA's Fowler Museum, which the show will visit late this spring, Anatsui explains that the exhibition title "Gawu" is derived from his native Ewe language. "Ga contains allusions to many things, including metal, and Wu references a fashioned cloak," he writes. "The word encapsulates the medium, process and the format of the works." "Gawu" is also an amazing exhibition, in any language.